UNISON welcomes the news that staff at Southend Hospital will now enjoy the same pay and conditions as everyone else in the NHS. Southend University Hospital is the only NHS Trust in the UK outside the national agreement on pay, terms and conditions known as Agenda for Change. The local terms mean staff in Southend were not guaranteed the same pay rises as their colleagues in other trusts around the country. Last year, the Trust agreed to mirror national NHS pay rates and now, following consultation with unions, it has agreed to move fully over to national terms and conditions. UNISON members at the Trust voted on the changes, with 88% backing a move to national terms and conditions. Nationally, 84% of UNISON members in the NHS voted in June 2018 to accept the three-year pay deal that Southend workers will now be a part of. Staff at the Trust will move onto the new terms on 1 April 2019. UNISON regional organiser Sam Older said: “This is great news for staff in Southend, and indeed the NHS as a whole. “Now a nurse, healthcare assistant or porter in Southend, Sunderland or Solihull will be paid the same rate for doing the same job. “Staff are better protected and treated more fairly if we can negotiate at a national level. “That’s how we secured huge rises for some of the lowest-paid workers in the NHS. “For instance, a band two healthcare assistants’ pay rates will have gone from £15,404 last year to £18,005 in 2020. 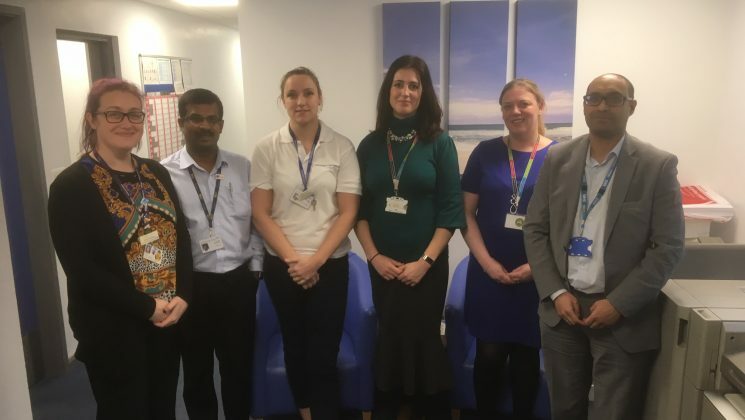 Pictured (l-r) are Kizzy Donaldson, UNISON Southend Hospital branch secretary; Jes‎ Johnselven, Southend Hospital Staffside chair; Stephanie Carey, SUHT Chartered society of Physios rep; ‎Sue Bridge, SUHT head of HR; Fiona Kennedy, deputy head of HR; Danny Hariram, Group HR Director (Southend, Mid Essex and Basildon)‎. Whatever happened to the STPs? What’s happening in our NHS?